Actually, a woman’s worth SHOULD depend on her weight. This includes plus size women. There are different kinds of weight that a woman can use to measure her self-worth and self-confidence. One type of weight is that of her body. But she should NOT base her self-worth on this kind of weight. Another type of weight is that ABOVE and BELOW her body. Yes, that’s right. A plus size woman’s self-confidence and self-worth will soar far faster and higher when she pays more attention to the amount of weight she can lift, rather than to how many images of herself in a bikini she’s posted to Instagram. — then Alicia needs to leap off that bandwagon and hop on the one headed for the gym. Wouldn’t it be great if “body positivity”could be defined by barbell positivity rather than bikini positivity? After all, posing in a bikini for “body positivity” shows people what you look like — which sends the message that a woman’s looks are the most important thing — that your body can be an ornament at any size! 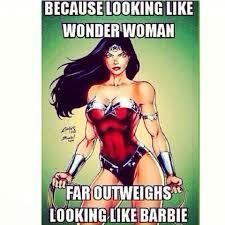 But lifting heavy barbells shows people what a woman’s body CAN DO, and a strong woman projects the ability to set goals, work hard and push one’s limits. Wearing a bikini can’t do any of that. “I think weight training with heavy weights is so essential,” says Ogechi Akalegbere, 31, a plus-size competitive powerlifter for six years. “Your mind sees that huge obstacle and you have to turn off the parts of you that say, ‘This is too heavy or this weight won’t come off the ground,’ and just do it. “And slowly but surely, you are stronger than you imagined you were when you started. “For me, lifting — especially with a barbell — is a therapeutic release. I am carrying around plates and [placing] them onto the bar. 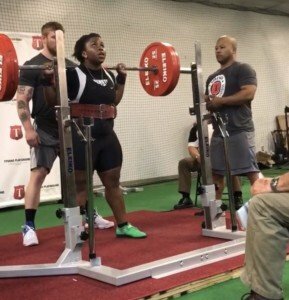 Ogechi Akalegbere about to squat in excess of 350 pounds. As a former personal trainer and lifelong fitness enthusiast – for the life of me – I just cannot imagine how a plus size woman could hate her body if that body is able to push 100 pounds into the air. Many plus size women indeed strength train. But many also do not strength train in a way that turns self-loathing to self-worth and self-love. Sure, if you stick with the 30 pound barbell for your deadlifts, this won’t do much to boost self-confidence. But if you focus on progression over time — you can be picking 100 pounds off the floor in no time. Come on, think about it: How could you feel disgusted with your body if you just pushed 85 pounds over your head – especially when three months ago you were only able to push 45 pounds? As a full-figured woman, perhaps you struggle with jogging or step classes. But the ability to lift heavy loads does not require sustained aerobics. When you can put 85 pounds over your head, or pull 200 pounds off the floor to your hips, or squat with 135 pounds across your back – by golly, you can’t help but base your self-worth on your weight – the amount of weight you’re lifting! When I was a personal trainer, one of the things I’d hear from numerous plus size clients was fear of how they’d look when working out. I assured them that I would not be having them do nutty routines like attempting pushups with one leg sticking in the air, or hopping on one leg while curling dumbbells. I’d have them standing in one spot, both feet on the floor, for the deadlift and squat; and lying on a bench for the bench press. A very large woman is on an even-playing field with thinner women for these powerlifting moves. However, multiple factors other than how much you weigh go into developing impressive strength. This is why there are size 8 women who can lift hundreds of pounds. Nevertheless, a plus size woman can learn powerlifting as well as any smaller woman. As a large woman sees progress in the amount of weight she’s lifting, her body positivity and self-love will also increase. Her bikinis will end up collecting dust — the mere props they are. Your self-worth will grow as the weight above and below your body goes up. It’s really that simple. Ogechi Akalegberehas a blog, gechmeifyoucan.com, and a YouTube channel, where she chronicles her training and other passions. Ogechi has a newly launched apparel business, Adaeze Designs: creating clothing that inspires.